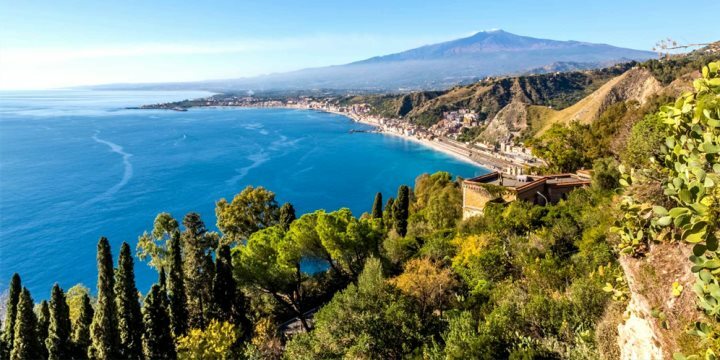 In the north east of Sicily the vast volcanic Mount Etna forms the stunning backdrop of some of the island’s most beautiful towns and picturesque beaches, including the understandably popular resort of Taormina. 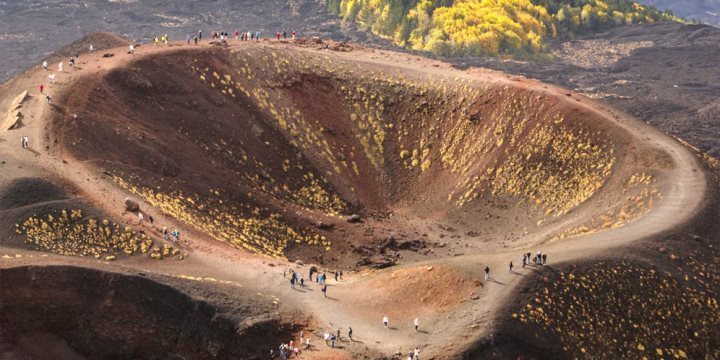 Etna, which is the largest active volcano in Europe, erupts frequently and a tour up to the crater is a must for any tourist visiting the island. Dating back to 4th century BC, Taormina today is a wonderful eclectic mix of the old and the new. A chic resort, though unashamedly touristy, it is arguably the most enchanting town in Sicily. One of her many charms is the beautiful restored medieval buildings on narrow, winding streets. Each evening people converge on the pedestrianized Corso Umberto for the passeggiata, a sociable stroll where the intention is to see and to be seen. People dress to impress and intoxicating perfumes fill the air. The street meanders through the old town, passing under ancient gateways and through one lovely piazza after another, each with a smattering of street musicians and artists, a great choice of bars and restaurants and exclusive designer boutiques and luxury jewellers. Half way along the Corso Umberto is Piazza IX Aprille with is the central square and the heart of Taormina,surrounded by beautiful buildings including the 17th century baroque church of San Giuseppe. The main focus inside this square is the terrace where locals and tourists alike sit and relax and watch the many caricature artists, and the children playing. This is also one of the best spots to enjoy the natural beauty of the area, with views of Isola Bella and Etna whilst you enjoy your coffee. 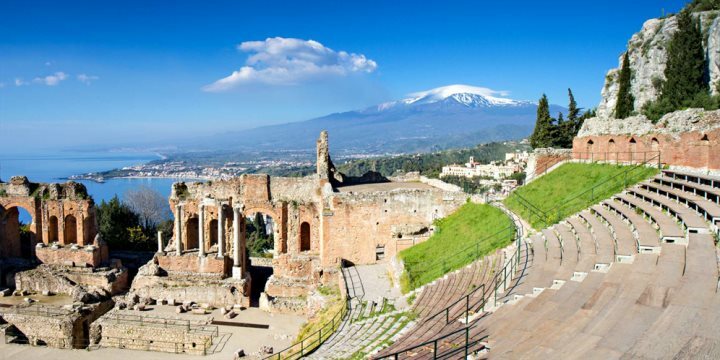 Eventually you’ll reach Piazza Vittorio Emanuele II, which connects to Via Teatro Greco, with its plethora of souvenir shops leading to the jewel in Taormina’s crown, the stunning Greek theatre, with its view across the Gulf of Naxos and a backdrop of Mount Etna. It's hard to imagine a more picturesque setting, and each summer it boasts an impressive schedule of events from rock concerts to opera as well as an annual film festival. The beach at Taormina, Lido Mazzarò, is a cable-car ride down from the town while nearby resides Giardini-Naxos, a charming seaside resort with a glorious bay of white sand and bustling promenade lined with restaurants, cafes and ice cream parlours. Both have breathtakingly beautiful views and both are very popular. Further south, though, Catania boasts vast stretches of golden sands while on the far north-east tip of the island, Mortelle has many more great sandy beaches to choose from. Giardini della villa Comunale is worth a visit as these beautiful gardens have an English connection as they were originally built by Lady Florence Trevelyan. From Michelin starred restaurants to simple traditional trattorie, you’ll find a wonderful range of dishes and indeed, restaurants, to try throughout the region. Vineyards producing excellent wines cover the lower slopes of Mount Etna, an area also known for its porcini mushrooms, chestnuts, sausages and citrus fruits, as well as the refreshing chilled granita, a semi-frozen dessert originally said to have been made with the snow from the volcano’s peak. And, of course, the azure blue sea provides an abundance of fresh fish and seafood. Castelmola is a lovely town located in the hills just north of Taormina and can be reached by taking a short bus journey from the main Taormina bus station. This town is famous for making almond wine - vino alle mandorle. Aci Trezza is a little seaside town with a couple of small streets, and rocky islands/outcrops - you might want to hire a canoe or a pedalo to explore. In the summer months there are a few bars along the waterfront, and you can get breakfast, and also watch the sunset over the water in the evening. The car park is a bit on the small side, however there is a regular bus from Catania. Aci Castello is a little village just outside Aci Trezza with a small central square and church, and a small castle ruin with a lovely view point and some amazing views across the buildings and over the sea. You can see also Mount Etna from here on a clear day. There is also a tiny (one room) museum housing some nice fossils which might be worth a visit if you have time here. In Catania, the Monastero dei Benedettini can be visited for a daytime or an evening tour which takes you in some of the underground parts of the monastery. There is a university here also that is free to look around. Also in Catania, Castello Ursino is a very pretty castle to visit along with the Museo Civico for a little bit of history from the 13th century. The Teatro Massimo Bellini is a gorgeous opera house in Catania, and smaller than the one in Palermo. This is a 1200 seat ornate gilt-edged theatre named after the composer Vincenzo Bellini.